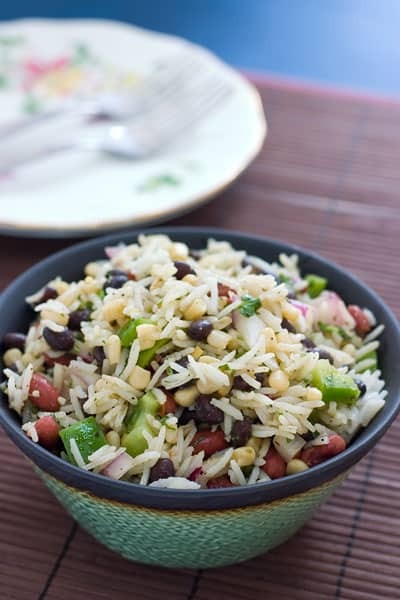 Here is a great way to enjoy the classic dish of rice and beans as a salad. This would be a perfect dish to take to a picnic, or just enjoy it as we did as a main dish. I created this dish as another one of my budget weeknight meals. I found some chipotle canned corn that I added to this. You could also use fresh corn or regular canned corn, and then add a few chipotle peppers, chopped and their juice. I also added red and black beans, and lots of fresh cilantro. It was very tasty, and since my son loves rice so much, it was perfect for him too. Don’t forget about the McDonald’s giveaway. You can go to my giveaway page here and in addition to entering the giveaway, you can also pledge family time you spend with your kids. For every second pledged, McDonald’s will pledge 1 penny to the Ronald McDonald House Charities. What a healthy side dish. We’ve been eating a lot of rice and beans lately, and we are still hankering for more! Thanks for sharing another variation of one of our favorites. meaty beans, crunchy peppers, chewy rice, fresh herbs–this is a magical salad indeed! This looks delicious! And what a beautiful photo! Salads like this are perfect for summer barbecues. No worries about leaving them out a bit longer than mayo based salads, and they work with almost any meat, don’t they? Wonderful! This looks delightful! I bet the cumin and cilantro add a perfect extra hint of flavors. The recipe looks terrific. I have never had or seen chipotle corn, but I am going to look for it at the supermarket. Your photo of the dish makes me want to dig right in. Lovely combination of ingredients, color and texture. Yum! Love this! I’d love it with quinoa instead of rice too! Yum! When I spent a summer in Corsica we had various rice salads for lunch every day (always with corn and tomatoes and whatever else was lying around) and I, who don’t normally love rice, couldn’t get enough! This version sounds delicious! I make something similar, but without the red beans and with diced tomatoes and salsa added. It’s especially good with cheese and sour cream wrapped in a tortilla. I sometimes add bacon for my husband, who has to have meat with every meal. This also makes a great soup in a beef stock with baked tortilla strips as garnish. I love this recipe. The only thing I change is adding about a tbsp more of white wine vinegar, just for a little extra tang. Delicious and I don’t feel bad about eating it!